It's the best day of the year! Happy Halloween, spookies! I can't believe Halloween is already here, and I have to tell you with the elation of my favorite holiday being here also comes a melancholy feeling that another Halloween season is nearly over. Today, though, is all about celebration, and I plan on eating pumpkin-flavored everything, putting on a costume, carving some pumpkins, and handing out candy to trick or treaters while marathoning Halloween movies all day and night long! -Visit a pumpkin patch - I visited Tanaka Farms Pumpkin Patch, a tradition I try to do every year (read about it HERE). -Drink pumpkin tea/pumpkin flavored coffee - Drank a lot of pumpkin tea and had many mugs of Califia Farms' Pumpkin Spice Latte (review); definitely going to continue this into the Thanksgiving season! -Watch as many horror movies as possible - Yes! Netflix didn't have many new options this October, but they had a ton of solid streaming flicks (see my list of 50+ recommendations! ), plus there were SO MANY awesome movie releases in theaters or on VOD that I checked out! 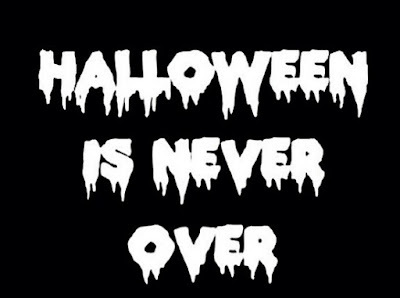 -Watch as many Halloween-themed movies, tv shows, specials, etc. - I have a huge stack of DVDs that I try to go through every year, usually starting in July, but this year I only watched a handful, including Hocus Pocus (multiple times), Roseanne's Halloween episodes, It's the Great Pumpkin, Charlie Brown, Halloweentown, Halloween, Halloween II, Halloween III, and a few more. I hope to watch many others tonight! -Burn pumpkin spice wax melts/candles 24/7 so my house always smells like an autumnal wonderland - Yes, definitely done. -Buy a new Halloween blanket - I bought two new ones, one from Target (yay, I actually found one this year!) and another from Ralph's grocery store (it's so velvety soft!). -Drink apple cider - I didn't buy any this year! -Wear scarves, boots, sweaters (quite the challenge in SoCal) - I did manage to wear a scarf to the pumpkin patch, but sweaters and boots were out of the question due to how HOT it was this October. Boo, I hate you SoCal weather! -Sample pumpkin or autumn beers - I had a few pumpkin beers this season, the newest one I tried was a pumpkin shandy that was pretty good! I certainly didn't live up to last year's epic list of autumn beers, but I still sipped on more than enough! -Carve pumpkins - Oh yes, I got this covered! And we scored with some really big and beautiful pumpkins this year. We started so early that a grocery store only charged us $5 for two huge pumpkins since they weren't in the system yet! -Crank up the Halloween music - Been rocking out to Halloween tunes since June or July! Check out my Halloween music mixes HERE! -Host a pumpkin carving party or horror movie night - Not this year, I didn't have the time to plan one. -Hand out vegan candy to trick or treaters - I've got the vegan candy (recommendations for candy from yours ghouly HERE and HERE!) ready for the little monsters! -Send Halloween cards to friends and family - I did a fun Halloween card swap with a bunch of Instagram followers that was so fun! -Come up with a costume to wear on Halloween night - I bought a cozy bat costume, and though it's a little warm, I'm gonna rock it tonight! -Watch Halloween cartoons - I watched a ton of old-timey Halloween cartoons via YouTube, as well as the traditional It's the Great Pumpkin Charlie Brown and The Simpsons Treehouse of Horror. -Visit the Halloween display at Roger’s Gardens in Newport Beach - Yes, and I loved the "Something Wicked This Way Comes" theme this year! You can check out pics of their gorgeous displays HERE! -Read The Halloween Tree and other Halloween-themed stories - I read these on my travels to my sister's wedding! -Check out horror movies in theaters - I saw Goodnight Mommy (slow and predictable, though it had some good visuals), The Visit (a bit goofy at times, but it was overall fun), Green Inferno (it was meh, I was expecting more gore), and Crimson Peak (it was so pretty, but left me wanting more!). -Roast pumpkin seeds - YES! Been munching on them all month! -Try new vegan autumn recipes - Unfortunately did not get a chance to try new recipes besides the Halloween-y ones I've been posting all month! Hopefully will do more for Thanksgiving. -Eat as many pumpkin-based foods (that are vegan) as possible - Um, yes! Been reviewing pumpkin-flavored EVERYTHING all month long! 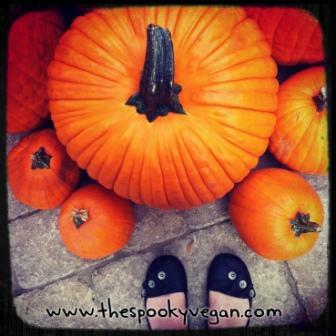 You can check out my top 10 pumpkin products HERE! -Make creepy and/or creepy cute Halloween foods - YES! I posted about these this month. I love how they turned out! Ok, so most of my completed items revolved around me eating or sitting around watching movies, carving pumpkins, etc., and I'm perfectly okay with that! 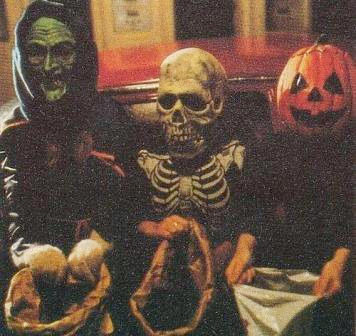 It's nice to have a laid-back Halloween season once in a while! What was on your to-do list this October and did you complete everything you wanted to do? Also, what are your plans for All Hallow's Eve tonight? Stay spooky, fiends, and Happy Halloween! Ran a 5k, the Eerie Erie as a cat, got a fancy dinner planned, a demon costume to hand out candy in, the Walking Dead to watch and plan to walk around after the trick r treaters are gone. Happy Halloween!! Wow, that's awesome! Sounds like a lovely Halloween!